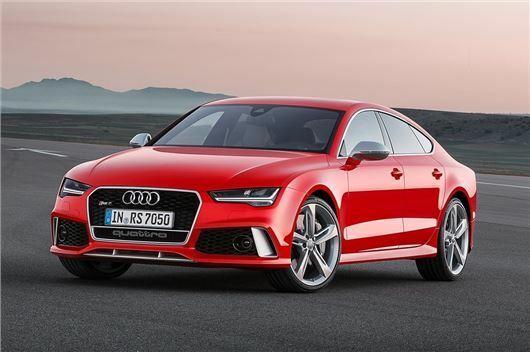 Audi has revised the high performance RS7 Sportback to bring it into line with the recently facelifted A7 Sportback. It gets minor styling tweaks, new LED lighting and changes to its V8 engine. The updated model will be available to order in the summer with the first cars arriving in late 2014. The exterior changes are minimal with squarer corners on the grille, changes to the front bumper and air inlets while the headlights are now LED as standard. Matrix LED technology is also available for the first time on the RS7 Sportback, with integrated dynamic turn signals on the front and rear. At the back the rear lights have a new design. There are new paint colours available including Floret silver metallic, Glacier white metallic, Mythos black metallic and Sepang blue pearl effect. The interior gets changes to the instrument cluster, the air outlet controls of the vent nozzles and the shift paddles behind the steering wheel. The standard MMI navigation plus with MMI touch now uses the modular infotainment platform of the latest generation. Engine power from the 4.0 TFSI remains at 560PS with 700 Nmof torque meaning the same 0-62mph time of 3.9 seconds. The optional dynamics packages allow top speeds of 174mph and 189mph respectively. Economy has been improved to a claimed 29.7mpg (up from 28.8mpg) and CO2 is down slightly to 221g/km.